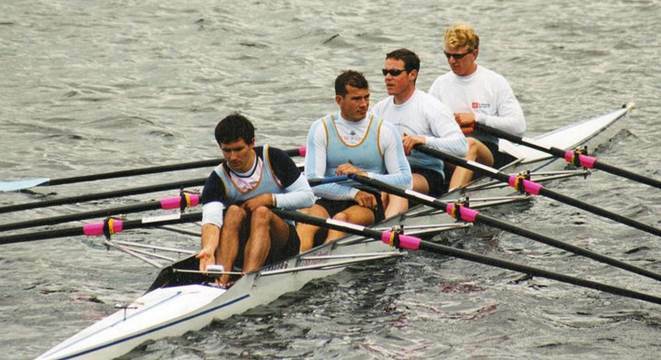 James (pictured in stroke above) rowed for UCD from 1997-1999 and again in 2001. 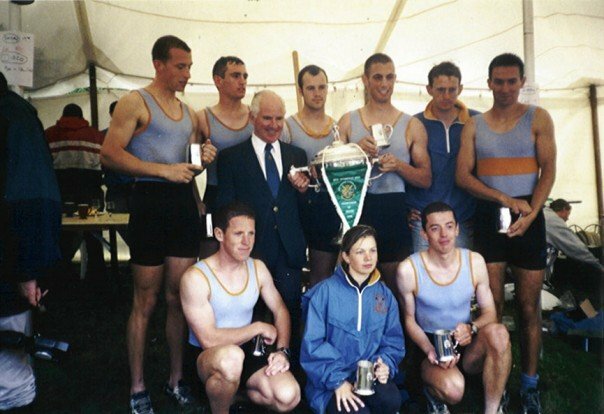 During his time rowing with UCD he won the Inter VIII National Championships in 1998 and the Gannon Cup in 2001. He hailed from Killarney and his home club was Muckross, and whilst he had success with UCD, he was first and foremost a Muckross man. He enjoyed great success in the Muckross colours winning the Novice Sculls Championship in 1999 and the Senior Coxed Four in 2000. He also won a Henley medal with Commercial in 2003 competing in the The Men’s Quadruple Sculls. So it’s true to say that wherever James rowed, success quickly followed. James achieved so much because he was a man of integrity – a man who put his all into every stroke. And by his all we mean more than mere grit, determination and athleticism; for James, rowing was about winning and winning meant doing everything possible to achieve the best boat speed. He was exacting in his approach to racing; to training and the ‘honest’ appraisals he gave us, his crewmates. As an architect, James understood how the devil is often in the details. To us, James was more of a divil for the details. In saying this, there was nothing too refined or regal in the way our friend from the Kingdom carried himself outside our boat. ‘Colourful’ is perhaps the best word for him. He was also truly unconventional, unpredictable and very entertaining to be around. He was constantly snacking – and when he was trying to make lightweight we took great enjoyment in catching him surreptitiously tucking into cornflakes (see above), bread and jam, and any other treat he could get his hands on. As we recalled, during those ‘middle-weight’ years, whenever anyone asked him what weight he was he would always quip, “the same as Johnny (Devitt)”. He was a lovable rogue who got away with his eccentricities. He was always late and always had an excuse – and we were always ready to make allowances for him. He was a scruffy sight; we reckon he only ever bought one one-piece for any club he represented and wore them until they were thread-bare. This habit earned him further renown as well as the affectionate moniker, “Manky”. His colourful nature, his unpredictability and his disregard for convention made him, his work and his passions eclectic and interesting. He fell in love with swing dancing and travelled to Scandinavia and Argentina to perfect his skills. He was an ambassador for swing and tango and was always happy trying to convert any of us he could to its many attractions. He built a worldwide circle of friends who shared his passion and we followed him vicariously (on Facebook) as he wandered the globe in a flurry of dance. It was put to me, and it is hard to argue, that he was unquestionably the best dancer UCDBC ever had in its ranks. He also knew how to throw a mean party. While in college during the summer of 1998 he worked with James McCullough as a bike courier. This tale sums him up beautifully – “He was crap, never knew where he was going, got lost every day, kept forgetting pick ups or drop offs, and was always letting his radio run out of battery. He couldn’t have made enough money to pay for lunch most days”. And yet he did. And he got away with it all too. Most recently James ran ‘Hyde Park Hounds’, a dog walking company in London. No surprises there. So I guess we can add best dog walker that UCDBC ever had in its ranks to his lengthy list of titles. He was a nonconformist who was the perfect fit for our crew and we loved having him on-board. Above all, James was a man who had the courage to be himself. He will be missed dearly and the world is a little greyer in his absence. 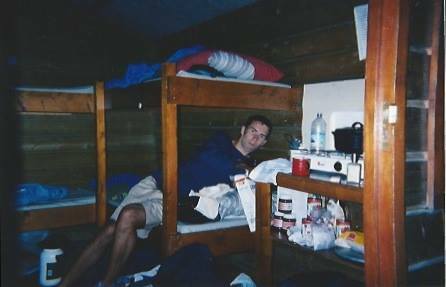 This entry was posted in RIP & Obituaries, UCDBC and tagged 1990s by admin. Bookmark the permalink. a lovely read, thanks! such an entertaining and enigmatic guy, it will be impossible to forget him. Nice touch and great stories. 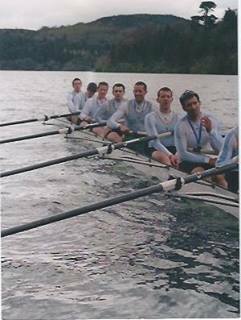 James was a great oarsman and fierce competitor, best I ever rowed with. I remember him filling us with copious amounts of caffeine before Galway Head 2002 where a relatively scratch senior 8 almost pipped the leading NUIG crew of the day, not to mention his barking about at the start of London Head that year that helped us finish 25th. So sorry to hear of his passing. He was always really friendly and fun. He’ll be missed. Well done to Colm and yourself on the lovely tributes. Thank you for a lovely tribute to my brother, I can relate to the constant snacking, scruffy clothes etc—most likely he was stealing my socks!